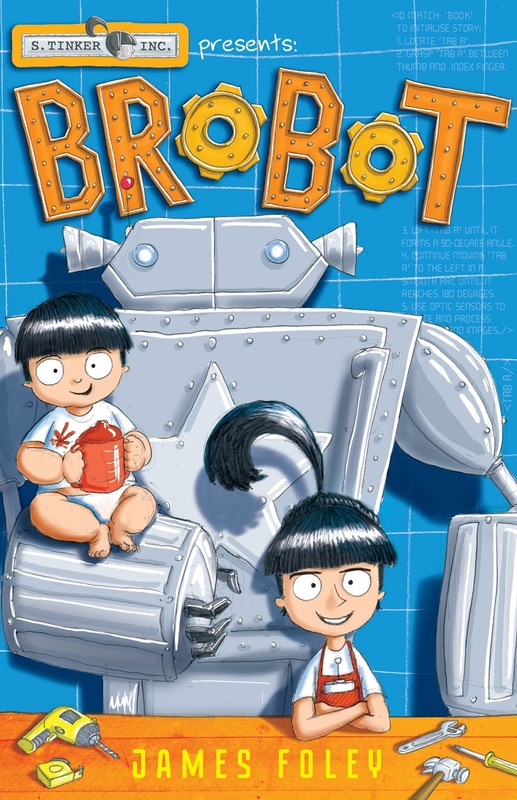 Brobot is a fantastic junior graphic novel targeted for children aged 8-10 years old, and has recently been released through Fremantle Press. The main character is 12-yr-old Sally Tinker, who happens to be the world's foremost inventor under the age of twelve. Sally has a baby brother named Joe, who annoys Sally all of the time, so she decides to build a better brother than the stinky, sticky one she has. He seems to be everything Sally could want in a brother, until the Brobo-remote gets damaged, and Brobot becomes totally uncontrollable! I loved the illustrations. They are black and white, and form a large part of the story. James Foley does a fantastic job of capturing both Sally and Joe's facial expressions and body language just through his drawings. Even though baby Joe doesn't speak one word, through these illustrations, he is given a voice, and plays a big part in the story. I adore Joe. He is such a cute little character! He gets up to a lot of mischief, but Sally soon realises that that there is more to Joe than she first thought. My 12-yr-old daughter read this book in one sitting, and she really enjoyed it. My 9-yr-old has just started it. The format of the story is described as a comic/chapter book blend. It would appeal to both male and female young readers. Disclosure: I was given a copy of Brobot in exchange for an honest review. I was not paid for this review. All opinions are my own, and not influenced in any way. Thanks for hosting the link up Denyse. :) This is a great book! Looks like something my son would love. I love reading funny stories with him. We both get the giggles. Possibly one to put on the Christmas Wishlist for your son; it's well worth it! Sounds like a great little book.